We don’t typically have a problem with store theft but we have prosecuted thieves before. Our employees are constantly making themselves available if someone needs assistance which tends to scare most thieves away. What’s amazing is that some visitors in the past have made comments that the black bubbles in the ceiling aren’t real cameras. They know you can buy the black bubbles to scare shoplifters away without having a real camera inside. The purpose of the black bubble is to hide the camera so that no one can see what direction the camera is pointing. If thieves could see where the camera is pointing they’d avoid those areas and target other areas where a camera isn’t watching. I assure you the black bubbles in our ceilings are real, working cameras. 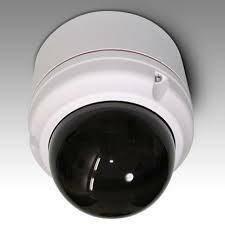 The videos created by the cameras are sent to a digital video recorder (DVR) that stores the videos for several months. We recently installed a few new IP cameras. These cameras are more modern. Besides having a high resolution, they include night vision, two way audio, hours of recording and can be controlled from a desktop computer or smartphone from anywhere. When I say controlled I mean they move up/down, left/right on demand. These cameras don’t have bubbles so anyone can see where they are pointed but no one knows how wide of an angle these cameras have. Sometimes, it’s a great deterrent to thieves letting them know they’re being watched.